Oyster die-offs – a new culprit? For years, research into West Coast oyster hatchery die-offs has pointed the finger at Vibrio tubiashii. Now Oregon State University researchers believe a different, but related, bacterium – V. coralliilyticus – may be the real culprit. The findings were published in Applied and Environmental Microbiology, by researchers from OSU’s College of Veterinary Medicine, the U.S. Department of Agriculture, and Rutgers University. The research was supported by the USDA. Scientists now say that V. coralliilyticus is not only far more widespread than previously believed, but that it can infect a variety of fish, shellfish and oysters, including rainbow trout and larval brine shrimp. And it appears to be the primary offender in bacterial attacks on Pacific Northwest oyster larvae. 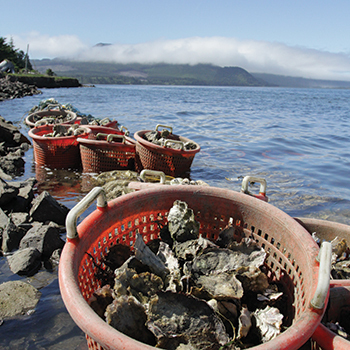 Häse’s previous work with Chris Langdon of OSU’s Molluscan Broodstock Lab has been supported in part by Oregon Sea Grant, which has also worked with Northwest shellfish growers to help them rebound from oyster die-offs. By learning to counter the effects of increasingly acidic seawater, which prevents larval oysters from forming the shells they need to survive, many hatcheries have seen production return. But while hatchery stocks are recovering, the scientists say bacterial infections remain a real problem for oysters – and other organisms – in the wild.